Commonsense & Wonder: Venezuela: This is Communism at work." No one can put up with this," a Caracas housewife complained Sunday as she tried to buy a chicken but discovered the bank machines didn't work. "There's been no water since last Monday, you can't call by phone, we can't pay with cards or even eat." Venezuela: This is Communism at work." No one can put up with this," a Caracas housewife complained Sunday as she tried to buy a chicken but discovered the bank machines didn't work. "There's been no water since last Monday, you can't call by phone, we can't pay with cards or even eat." Why does the media protect Maduro's Venezuela? See any any horror stories in the press? 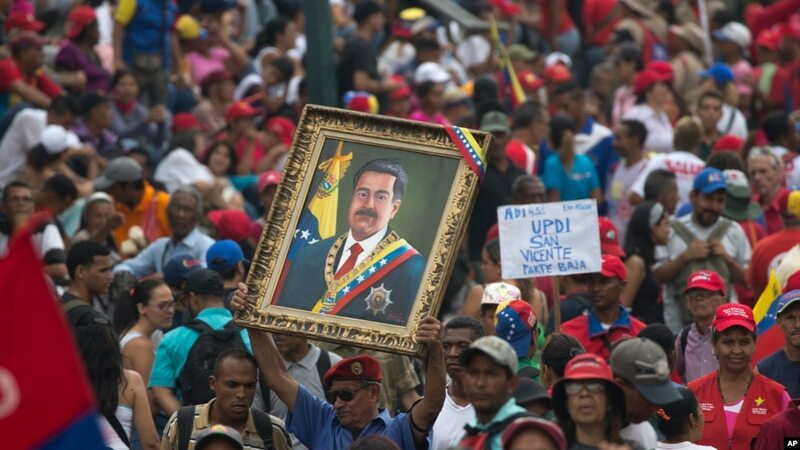 A government supporter holds up a framed image of President Nicolas Maduro during an anti-imperialist rally in Caracas, Venezuela, Saturday, March 30, 2019. Venezuelan President Nicolas Maduro, in an address Sunday on state television, announced a 30-day plan to ration electricity. The rationing plan, Maduro said, will also help the government deal with the country's water and communications infrastructure. On Sunday, residents fed up with the recurring electrical blackouts protested by banging on pots, burning garbage in the streets and shouting curses against President Maduro. Maduro said schools would remain closed and the length of the workday will be cut to conserve power during the 30-day period. "No one can put up with this," a Caracas housewife complained Sunday as she tried to buy a chicken but discovered the bank machines didn't work. "There's been no water since last Monday, you can't call by phone, we can't pay with cards or even eat." Another homemaker said she can't refrigerate food and said when her appliances break, it's impossible to buy a replacement. 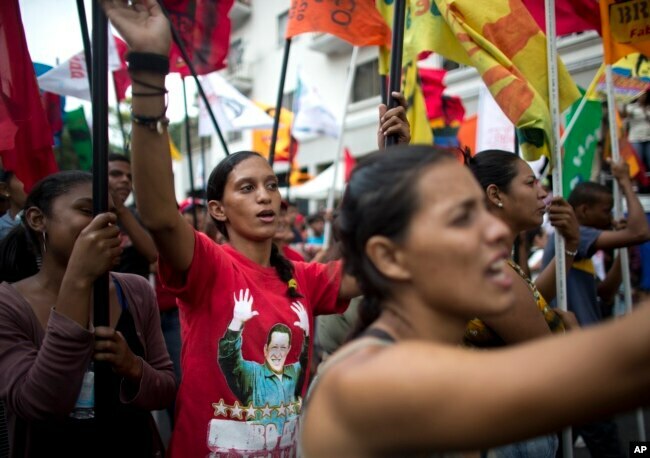 Government supporters march during an anti-imperialist rally in Caracas, Venezuela, Saturday, March 30, 2019. ​Maduro has blamed the blackouts on U.S. sabotage. Opposition leader Juan Guaido says government neglect and mismanagement are responsible. "They brought the electrical system to a collapse because they are corrupt and now they can't resolve it because they are incapable," he said. Guaido used his constitutional authority as head of the National Assembly to declare the Maduro presidency illegitimate, saying he was re-elected in December in a fraudulent vote. The United States and about 50 other countries recognize Guaido as president. Washington has imposed numerous sanctions against the government, but Maduro is refusing to step down.